The National Oceanic and Atmospheric Administration (NOAA) is completing a study that sets the value of the Hawai’ian coral reefs at $33.57 billion. This assesment, the first of its kind, will be useful in setting policy to protect the reefs. Read full Maui News article. SB580, the state measure regulating the aquarium trade to protecting all of Hawaii’s reef wildlife has been scheduled for a Tuesday hearing in the Senate Judiciary Committee chaired by Sen. Clayton Hee. 4) Testifier position: Chose whether you want to Support or Oppose the bill for stronger regulations. 5) Write your testimony in the comment field or upload your testimony, if longer. 6) Check the box, ” I understand and agree to the terms above “. Maui County Council again challenged the largest wildlife exporter in Hawaii Friday, with a new law requiring humane treatment of reef fish captured for the aquarium trade. Finning, fizzing and starvation of colorful fish prior to shipment are now illegal, as the campaign to ban aquarium collecting from its most lucrative source, Hawaii, gains momentum. The new humane treatment law responds to unlimited trafficking in wildlife for the pet trade that has gone unchecked for many years in Hawaii. The reported catch revenue of about $2 million is believed to be far less than actual revenue on unreported/poached catch. Actual aquarium revenue may be $20 million, but that figure pales beside the $800 million annual in reef-based tourism. 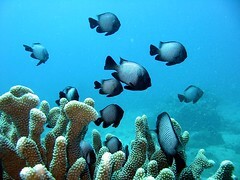 Hawaii reefs and reef fish populations are in decline. The aquarium trade denies culpability and demands more, with no limit on the catch, no limit on the number of catchers and no constraints on endemic or vanishing species. Read full Huffington Post article. The Reef Sustainability Committee invites everyone to participate in any or all of the upcoming projects. The Turbidity Task Force project is ready to start training water quality monitoring volunteers. We have 1,000 testing kits now created. For those interested in learning more about the program as well as how to enter data online we are meeting at the Whale Sanctuary in Kihei Thursday June 3rd 6:00-8:00 P.M. The Maui Nui Marine Resources Council meeting on June 9th 5:00 -7:00 P.M. focuses on clean water issues. Jonathan Starr and Robin Knox are giving presentations. South Maui Sustainability is part of the South West Maui Watershed Project Advisory Group. The public has an opportunity to affect the choices we make for water usage in the future, and is encouraged to participate. The next meeting is June 10th 3:00-5:00 P.M. at the Whale Sanctuary. Our next Beach Clean-up at Kealia National Refuge is June 26th 8:00-10:00 A.M. Contact Teri at teri at southmauisustainability dot org for cleanup details. On July 15th at 9:00 A.M. Maui Dreams and the Reef Committee is sponsoring another Fish ID class at Maui Dreams in Kihei followed by a fish survey snorkel at Ulua Beach. Space is limited so please RSVP at teri at southmauisustainability dot org. The Reef Committee has partnered with Maui Dreams Dive Co. and Project Sea-Link to present a free novice fish identification program. The class will be followed by a snorkel fish survey at Ulua Beach, conditions permitting. Space is limited so please contact teri@southmauisustainability.org to confirm. We will meet at the new public parking lot, but please try to park your vehicle on the dirt area and leave the parking lot for the general public. Check-in with our cleanup coordinator, Katherine. We have a limited number of pickee-up-thingees for those who need to save their backs, so get there early! On September 10, 2009 Robin Knox spoke at the monthly SMS meeting about South Maui water quality and how we can have a hand in designing and creating the South Maui Watershed. Robin Knox is an environmental scientist with more than 25 years experience in Clean Water regulation and pollution control. She specializes in developing water quality-based pollution controls that protect aquatic resources from man-made sources of pollution.